Nearly two decades later, John McCain is still haunted by his role in the Keating Five scandal. His role in the 1980s banking scandal is featured in a new Barack Obama attack video. McCain's presidential campaign quickly moved to limit any damage. The Republican senator's lawyer in the case, John Dowd, told reporters in a conference call Monday that McCain had been the victim of "a political smear job" by Senate Democrats. When a reporter noted that McCain himself has spoken contritely about his role, Dowd responded, "I'm his lawyer and I have a different view of it." McCain said his reputation was so tarnished by the Keating case that he compared his ordeal - in some ways - to the torture he suffered as a prisoner of war. "I faced in Vietnam, at times, very real threats to life and limb," McCain told The Associated Press in a written statement last March. "But while my sense of honor was tested in prison, it was not questioned. During the Keating inquiry, it was, and I regretted that very much." The Obama video was released after Alaska Gov. Sarah Palin, McCain's running mate, criticized Obama's association with Bill Ayers, a founder of the Vietnam-era radical group the Weather Underground. The Keating Five were four Democratic senators, and Republican McCain, who accepted contributions from Charles Keating Jr., a real estate speculator and savings and loan owner. His institution failed and cost many investors in uninsured financial products their life savings. Once close to Keating, McCain received $112,000 from him, his family and associates. The senator and his family also flew in Keating's plane to the Bahamas and - in the events that triggered the Senate investigation - took up his cause with financial regulators as they were investigating the businessman. Keating eventually went to prison. McCain eventually repaid $112,000 to the U.S. Treasury and reimbursed Keating for the trips. The irony of the Keating case is that McCain received the mildest ethics committee rebuke of the five senators in 1991, and was kept as a defendant because he was the only Republican. The special counsel in the case had recommended that McCain and one of the Democrats be dropped as defendants. But Democrats, who controlled the Senate, refused to take all the heat for the scandal and all five remained in the case to the end. McCain, in his book "Worth the Fighting For," lamented that the senators "were now a two-word shorthand for the entire savings and loan debacle and the rotten way American political campaigns are financed." He also wrote: "My popularity in Arizona was in free fall. ... I expected a rough, and quite possibly unsuccessful re-election campaign in 1992. To the extent I was known nationally anymore, it was as one of the crooked senators who had bankrupted the thrift industry." Dowd, in his conference call, wouldn't tolerate a hint of an apology for McCain's actions. "John was the only senator who threw Charlie Keating out of his office," he said, reminding reporters of a well-publicized confrontation. Keating had called McCain a wimp for failing to do more to influence financial regulators on his behalf. 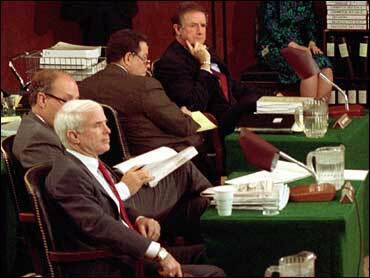 McCain is the only Keating Five defendant still in the Senate. The senators were accused of trying to intimidate regulators on behalf of Keating, who along with his associates, raised $1.3 million combined for the campaigns and political causes of the five. The investigation ended in early 1991 with a rebuke that McCain "exercised poor judgment in intervening with the regulators." But the ethics committee also determined McCain's actions "were not improper nor attended with gross negligence." The committee said more than one year had passed - a "decent interval" - between the last contributions Keating raised for McCain and the two 1987 meetings he attended with banking regulators. None of the five senators was punished by the Senate. "The appearance of wrongdoing, fair or unfair, can be potentially as injurious as actual wrongdoing," McCain told the AP in March, reflecting on what he said were his lessons from the scandal. "Also, when questions are raised about your integrity or for that matter anything involving your public career, even, for example, a controversial position on the issues, it is best not to hide from the media or public." Keating went to prison for more than four years after a federal fraud conviction. The conviction was reversed on appeal after he argued that jurors improperly had knowledge of a prior state conviction on related charges. He was to be retried in federal court but instead pleaded guilty to four federal fraud counts. Keating admitted he siphoned nearly $1 million from his S&L's insolvent parent company. He was sentenced to time he already had served.